Transportation Control Management: Tracking a proper implementation of transportation routes, sending inspection forms, receiving data and reports from vehicles, managing irregularities, alerts, etc., and creating automatic and on-demand reports for different levels of management functions. Propriety management and monitoring for public transportation stations: Production of detailed test reports of the health status of different types of stations, creation of test tracks, management of testing and reporting teams at various levels. 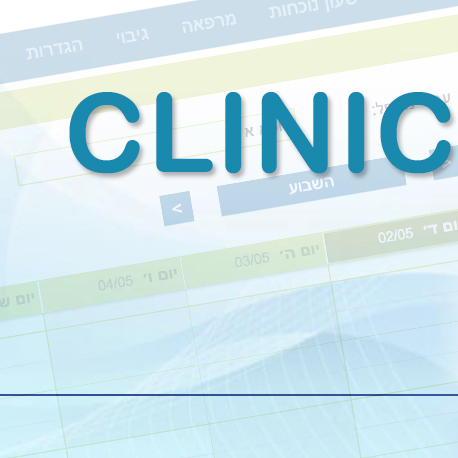 Management of various types of clinics: A complete solution for management of clinic networks, including clients portfolio, employee management, diaries and meeting management, various reports at various levels, payment, email and SMS messaging, patient appointment scheduling interface and more. Access control systems management: The system interfaces with entry/exit control hardware systems and enables the management of entry permissions in a variety of options and levels, real-time monitoring screens, event monitoring, alerts and alarms and various reporting options at various levels. Suitable for parking lots as well. Management and monitoring of alert systems for health care and nursing institutions: The system interfaces with different alert and monitoring systems and hardware components, and provides management of various kinds of signals received from different sensors, alerts and alarms for caregivers and supervisors, real-time and on-demand reports at various levels. Artwork transfer management for museums and galleries: The system allows creation and management of various artwork shipping tasks, including details of the exhibits, shipping teams and shipping routes, receives reports from the teams in the field at different stages of the shipment, including reports incoming from secure wireless location readers, route tracking, exceptions management, alerts and alarms, and various kinds of status and other reports at different levels. The systems structure is based on multiple types of user interfaces covering a wide range of uses such as managing customer databases, employee management, diaries, various reports, reporting tools (email, SMS), clearing and managing payments and many more. A wide range of standard modules, and custom developped modules according to customer and project requirements, can be integrated. 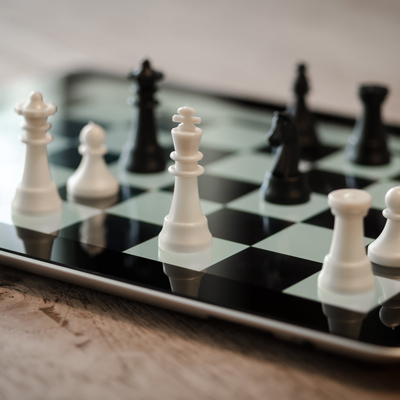 Unlike CRM systems, our software systems provide the customer with a tailor-made solution that includes all the management, automation and functional requirements required for the customer, even for unique and very specific needs. Our systems are designed and constructed in a way that let the user get the entire picture instantly and clearly, for each type of task and on every screen of the system, and an immediate understanding of the options available to them in every situation of the system. See examples below. In order to keep the privacy and confidentiality of our customers and their systems and due to their secure nature, it was not possible to present many examples or provide detailed descriptions of the systems. 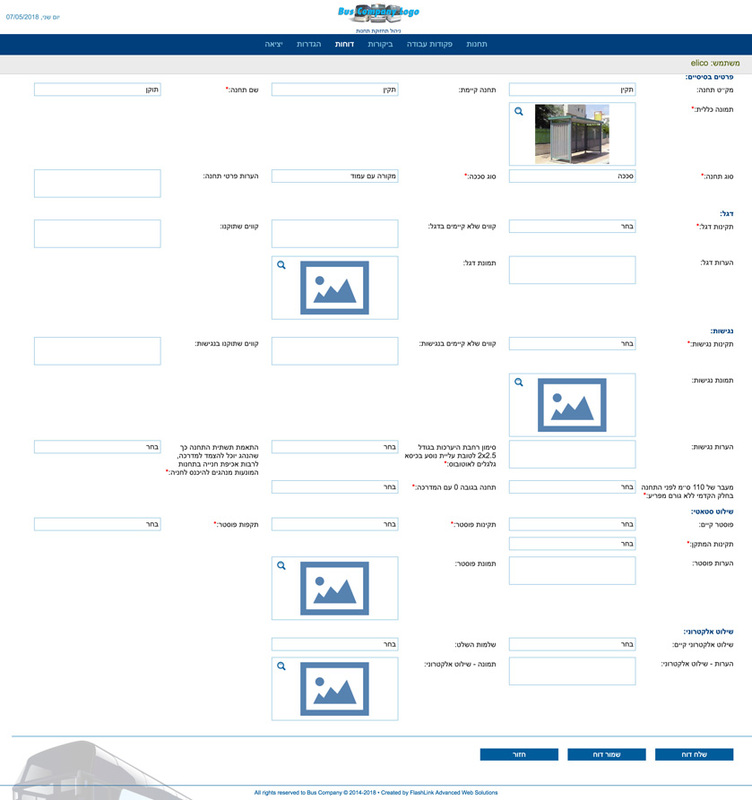 However, the example screens provide a good idea of the system. Interested in web software? fill in and send. We will contact you shortly. Public transport companies are required by the Ministry of Transport to conduct periodic inspections of their stations, locate faults or omissions in the station signage and other characteristics, send repair teams as necessary, and provide periodic reports to the Ministry of Transport. 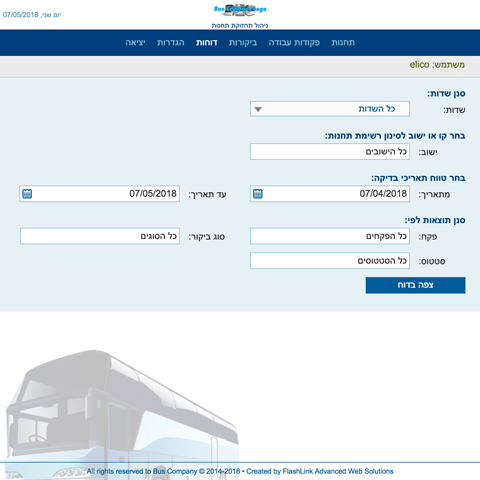 The Stops-to-Go system is operated by public transport companies in Israel, and is used by them, with various custom adjustments, to perform these tasks. Displaying the routes of all the company's routes, including the status of the stations of each route and the dates of the last inspections on the them. Creating and editing of work teams, auditing and reporting, management functions, test station characteristics, station types and more. Selecting routes for generating work orders signed by the system administrator, including inspection instructions for the station stations, within selected date ranges. Each work order includes an interactive map that specifies the location of the stations and enables navigation software activation for stations in the route. Each inspection team receives an inspection form per each station, which they fills and updates according to different station health characteristics, including taking different pictures of the station parts which are added to the report, via a tablet or smart phone. When the audit is complete, the report is sent to the system server. Similarly, the system monitors repair teams that receive reports in which defects were found and corrected, and audit personnel who patrol the stations and verify their correctness after repairs. The administrator receives detailed, interactive reports that include all the findings and station status in selected cross sections, including various alerts, and can provide feedback to the teams and establish new inspection and repair rounds. Upon approval of the report by the Director, the system produces a reporting form that complies with the regulations of the Ministry of Transport and the report is sent to its destination. The system enables patients management, care tracking, care givers appointments diary, invoices and clearing, digital signatures, meeting scheduling for patients, reminders and messaging management, push-button reports - all of which are free of charge and experience. Do you already have an old system? 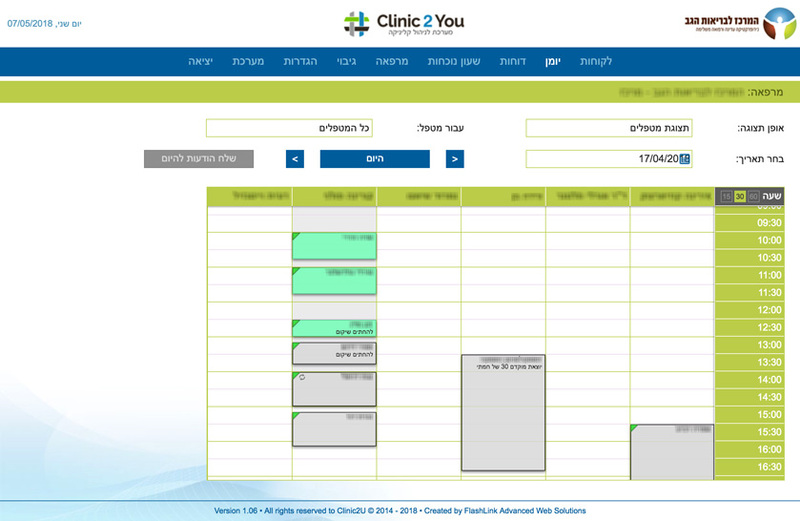 No problem, Clinic2U was built specifically for easy and simple transition. The system is also suitable for clinic types of other then complementary medicine, such as: psychologists, schools, nursing homes and more. Cloud-based system - The system is accessible from anywhere and at any time and no installation is required. Ordering treatments online - The clinic's patients can schedule appointments via the internet. Sending SMS reminders - The system is designed to send SMS messages efficiently and easily to all patients with a single click. 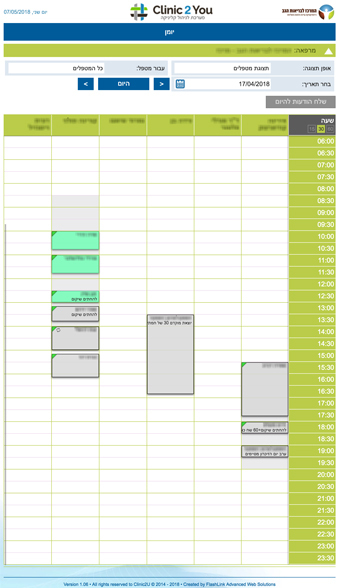 Customer acceptance of to text messages are shown in the diary. Tracking the client file - Each patient has a history file that enables management and registration of the treatments given to the patient. 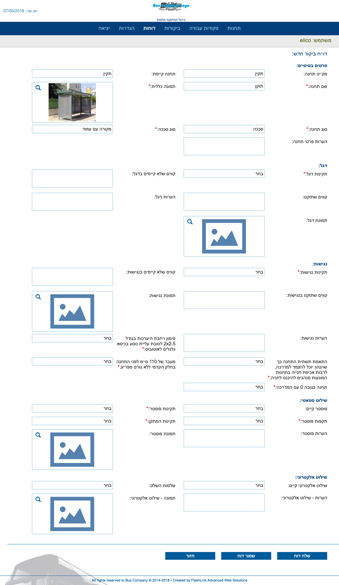 The entries can be classified into several categories such as diagnosis, comment and more. Salary report generation - The system enables automatic and convenient salary generation for all clinic staff, saving headaches and time at the end of the month. Built-in Invoice and billing system - eliminates the need for "paper" invoices. This feature streamlines customer billing on time and enables payments to be made in a variety of ways, and automatic mail delivery of invoices.